There is just something compelling about watching a woman spin fire. Yeah, yeah, I know. It's hot. But there is more to it than that, I think. 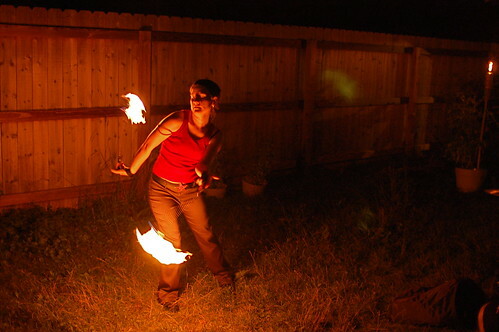 I see a lot of people spin fire, be it on poi, staves, whips, finger torches, fans, swords, and even hoops. For now, and maybe in the circles that I move, spinners tend to fall into the 17-30 age range in sort of a bell curve. I would guess that the gender split is about 50-50. Part of what appeals to me when I see a woman spinning is that it requires all the grace and agility of a dancer, coupled with a complete willingness to stink like fuel, get dirty, wear sturdy flame-resistant clothing, and become the center of attention. Starting down the road of spinning fire is to embrace a yang presentation of femininity. It is the manifestation of the strong woman; the woman who is comfortable with her self and does not care that she is not wearing makeup and (flammable) hair spray to attempt some Cosmo version of beauty. Rather, the fire spinning women seem to simply accept that people find them attractive just as they are. There is little pretense or artifice. It is an attractive presentation to a Leo - those who in astrological terms are the reckless teenagers of the fire signs. 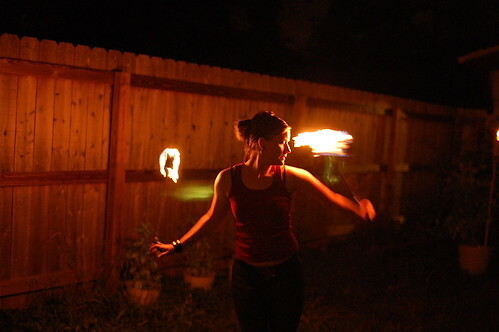 This fire spinning was performed at a 4-Leo birthday party. It was Katie's present to our birthday-boy host. Thank you, Katie, and happy August birthday's to Chris, Marko, Theresa, and me. yes, yes... we Leos do love fire! I have secretly always longed to learn how to spin fire, but the Capricorn rising in me keeps me in the shadows, just yearning to bust out and become FIRE GIRL! Oh well, maybe one day the Wizard will grant me the heart to do what I want. In all seriousness, congratulations. You have some cool VIDEO on your site. We have footage from one of our guys spinning at burning man. Check it out sometime.